I wrote a message with no ascii characters. I didn't finish it so I just closed it, the message went to the Drafts folder. When I tried to continue editing, the original characters were incorrect, there were a lot of ? characters (see attachments). 1. Write a message with no ascii characters. 3. Look/Open the message for editing again. No ascii characters are incorrect. No ascii characters are correct. The original language is Czech, characters encodings utf8 (see attachments). 2. click on right mouse botton for show context menu and select "properties..."
all messages in the folder..."
ps: in general you should be set as uncheck this flag on all folders (Inbox, Sent, Draft, ...). That option has already been unchecked, hence this is not a solution. Additionally, I've noticed this ridiculous behaviour in the Sent folder. I've just attached a couple of eml files as requested by Aureliano Buendía. I've had a look at the Base64 encoded part and I'd say there's something wrong during the encoding phase, the characters are wrong. Btw, pay attention to the file 04-some_ascii_and_czech_characters_from_the_1st_line_on_a_keyboard_between_keys_+_and_=.eml , the non ascii characters are OK!!! Can I help with whatever? Is anybody taking care of it? It IS really annoying issue! I've got utf-8 as a default for all. Hope that helps to nail down this annoying problem. I experience it every day since I switched to TB3. Still the same with TB 3.1.3 - extremely annoying. To make sure it is only TB I switched off all Add-ons - result is still the same. To best reproduce make sure you have no other emails open in TB and switch of the preview window (F8). Close and restart TB. Then view an inbox email with Latin-1 (ISO-8859-1) encoding, close it again and open a UTF-8 draft email. Result: All UTF-8 chars will display incorrectly. Same problem for me with TB 3.1.6 on Windows 7 x64, it's really extremely annoying. I always disable the Message Pane when using TB. This seems necessary to reproduce the problem! To work around it:  Reenable the message pane by pressing F8. As soon as you click on a msg in the drafts folder, it is shown in the message pane - and there it is always showing the CORRECT encoding! Looks like the problem only happens when opening msgs without message pane preview. With the pane active you can also double click any draft msg to open it in its own tab with correct encoding (probably because just before opening the tab the encoding has been correctly set for the message pane preview). Do you still see this issue when using version 5 or 6 (due out in a week)? - If you still see the problem, please provide updated details, and any additional steps needed to reproduce the problem. This issue was still very much alive and kicking with the latest 3.1 of Thunderbird, but doing some tests with 5.0 I could not reproduce it within the last 10 minutes. Considering the fact that the bug always appeared quite erratically (probably depending on the encoding of the last emails that had been opened before reopening a draft email) and was never easy to reproduce, I would prefer to leave this bug report open for some more weeks. If I drop again on the issue I will leave a note here. It just happened again. Unfortunatelly no easy way to reproduce it. As I said above the message pane must be switched OFF. An active msg pane clearly has the side effect of initiating the correct character decoding. Without msg pane the character encoding when reopening a draft email seems to depend on the encoding of emails that have been opened before. But I am not able to create a clearly reproducable setup to provoke the error. It probably depends on multiple factors and on the usage history before reopening a draft email. It is an email reply that I had saved to the Drafts folder and reopened later. The corrupted display vanished when I reopened the draft with msg pane activated. It also vanished when I restarted Thunderbird and reopened the draft before opening any other email. And still the same problem in TB 16.0.2. Character encoding of emails stored in Drafts folder is lost when they are reopened while the message pane is switched OFF. + Make sure you have a UTF-8 encoded email with accented characters (e.g. äöü) saved in Drafts folder (write UTF-8 encoded email, hit Ctrl-S to save, close email without sending). + Switch OFF message pane using F8 key toggle. + Reopen email saved in Drafts folder by double-clicking it. Check whether accented characters appear correctly. This step does not always reproduce the problem, so keep trying. Open other emails from Inbox in-between trials - preferably emails that are NOT UTF-8 encoded (e.g. Latin-1). + Open message pane using F8 key before reopening emails from Drafts folder. + Double clicking emails in Drafts folder will then open them correctly as they are first loaded into the msg pane, which eliminates the problem. + Any versions of TB from 3.0 to current 24.3. + Reproducible on Linux, Win XP, Win 7 and Win 7 64. So probably not OS dependent. Confirming on trunk, thanks for the STR! I also have this issue in Icedove (Debian stable) 31.8.0, a collegue has it on a current Thunderbird on Windows 7. Still happens in Icedove 38.4.0 on Debian Jessie (stable). I've changed OS and hardware as apparently this issue is OS-independent (happens on Windows and Linux) and also hardware independent (happens on x86 and x86_64). Note that having the message pane closed is not strictly necessary to trigger the issue. Another (also not always reproducible) way with open message pane is to save an pgp-encrypted mail to draft, restart thunderbird and open the message without previously entering the decryption passphrase. The effect is the same - the message isn't prerendered in the message pane and the editor then uses the wrong encoding. I've corrected the title slightly in order to reflect this. Fixed by bug 597369 or bug 1239658. 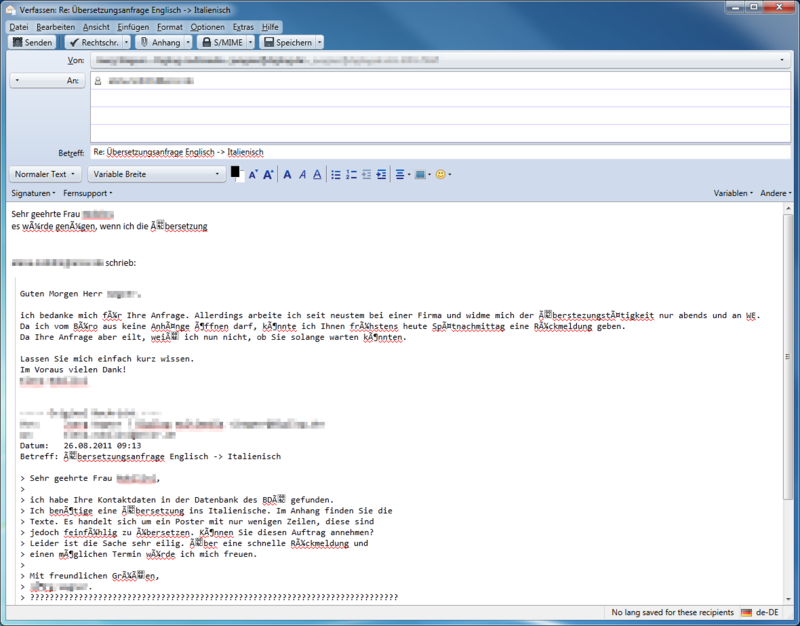 Right click on "Entwuerfe" (drafts) and select a fix  text coding (Unicode (UTF-8)). Now I can safe and reopen drafts with the right non-ISO characters.